I'm not sure if these 10 minute robots are becoming a thing with me, but I sure am having fun with them! As I prep to really dive into some larger pieces, they're a great quick little exercise to get me (and my mind!) going. I had so much fun with the last ones, that I went out and bought some more of these little birch boards & ended up painting a couple more this weekend. 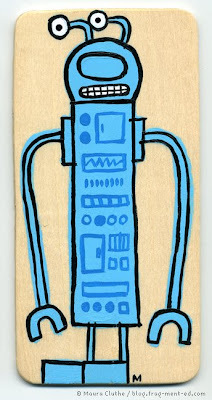 Since I have a handful of these now, I went ahead and created a set for these 10 minute robots on my flickr page. Check 'em out - more to come! 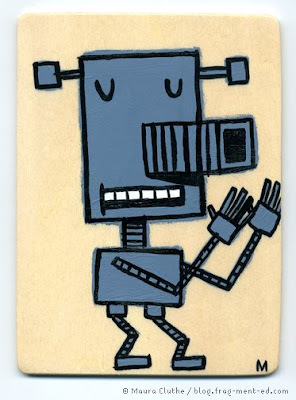 I stumbled on to your blog through someone's links and I am enjoying your "robot phase." It's amazing that once you get tuned in to a specific image, how they start to pop up in the most unexected places! I am going through a "bird phase," myself. Would you be willing to share where you got the birch boards from? They look like they're a nice size.